Home/Blog/The Threat of ‘Megacatastrophe’: Is Your Business Prepared? In his recent annual letter to investors, business magnate Warren Buffett believes that a catastrophe in the form of either a human-made disaster, a cyber-attack or a major hurricane is looming over humanity. Even though the timeline of this dreadful event is unknown, Buffett assures: “When such a megacatastrophe strikes, we will get our share of the losses and they will be big — very big.” In this blog post, we are taking a deep dive into the empirical evidence of disaster recovery statistics to help your organization take the necessary steps to get prepared. According to NOAA National Centers for Environmental Information (NCEI), there have been twenty-six-billion-dollar weather events in the United States since 2017. The severity and frequency of weather-related disasters have increased in recent years. 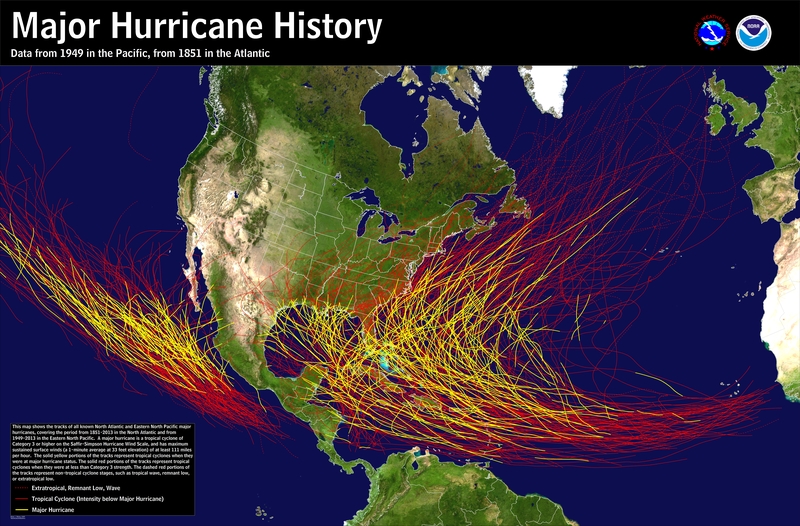 National Weather Service developed a shocking map, demonstrating the tracks of all known North Atlantic and Eastern North Pacific Hurricanes. In addition to that, Agility Recovery has anticipated that 70% of businesses or organizations will face a power outage within the next 12 months, with a 10x increase in recoveries in the past ten years, leading to more than 350 business recoveries in 2018. Specifically, in 2018 14 different weather-related events wreaked havoc nationally, with losses exceeding $1 billion each. Although the world’s population isn’t the major cause of natural disasters, they are intensified by isolated events like a burst pipe, vehicle crash, or theft, which have a lot more chances to affect businesses anywhere, putting companies’ operations on hold and dwindling their revenues. With an evolving nature of the risk in the modern networked society, more and more businesses are faced with a continuously increasing number of business interruption scenarios. Some of those scenarios may not result in the actual physical damage, but rather lead to significant financial losses. The new year promises to be as perilous as the previous ones. The findings in the risk ranking report by Allianz shows that the leading dangers for companies in the US are business interruption (40%), cyber incidents (36%), and natural catastrophes (33%). According to RIMS Business Interruption Survey, 40% of companies have experienced a business interruption in the past five years. Based on Agility’s own recovery statistics, the three top events that affected businesses’ continuity in 2018 were hurricanes (45.3%), isolated events (30.2%), which include everything from a planned construction to a rodent infestation, and winter storms (13.1%). With all the numbers being thrown around on the internet in great quantities, let’s not forget about the fact that behind those numbers are real businesses, real companies, and real people. The question, however, remains: is your business prepared? any organization should take to build resilience in the face of all manner of threats.